Mon., Sept. 24, 2018, 7:44 p.m.
PULLMAN – Like everyone else, Mike Leach replayed Porter Gustin’s controversial hit on Gardner Minshew while he reviewed game tape from Washington State’s 39-36 loss to USC Friday night at Los Angeles Memorial Coliseum. Scrubbing through footage of the collision – in which Gustin can be seen launching himself at Minshew headfirst before viciously striking the quarterback’s helmet with his own – may have been just as disturbing for Leach as it was for any WSU fan that saw the play in person or on television. And the only thing potentially more disturbing than the hit itself for Leach and the Cougars was the fact it went un-penalized at a crucial point in the game. 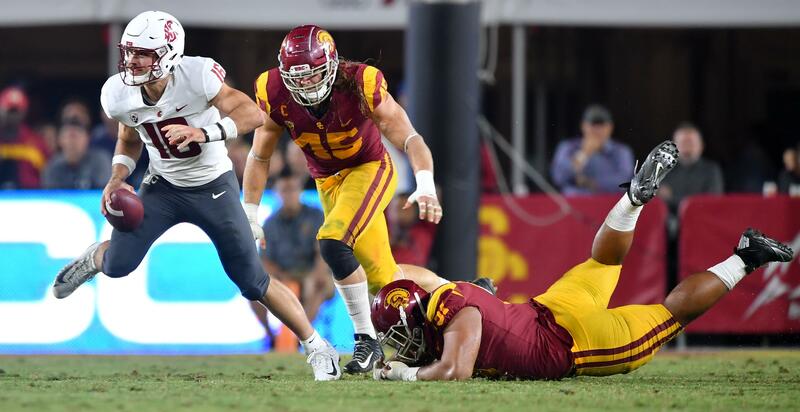 Had Gustin been ejected for targeting, USC would’ve had to finish the final two minutes of the game without its top linebacker and the Cougars, who were already threatening from the 25-yard line, would’ve been 15 yards closer to the end zone. But Leach wisely held his tongue when asked about the collision Monday during his weekly news conference. “Well, I’m not allowed to comment on it,” Leach said. He encouraged reporters to take a deeper look, though, and reach out to someone who could comment. Dixon acts as the General Counsel and Senior Vice President of Business Affairs for the Pac-12 Conference. While Leach said it wasn’t apparent Minshew had been shaken up by the play – “not necessarily,” he said – he admitted it was “a big hit” and made a ploy for player safety. “Anything we do in this conference, player safety should be the forefront of our concerns,” the coach said. By the time Minshew was jolted to the ground by Gustin in the fourth quarter, officiating had already become a point of criticism among Cougar fans and players. WSU’s defensive backs seemed irked by the amount of pass interference and defensive holding calls that came their way. The Cougars drew three pass interference penalties on Friday – two more than they’d received through the first three games of the season. Asked how he interpreted those calls, Leach initially responded “I’ll tell you what” before taking a pause and continuing with his answer. Published: Sept. 24, 2018, 7:44 p.m.